I am a scientist-physician interested in evolutionary systems biology and the probabilistic formalization of collective clinical decision-making. In this paper we first review existing uses of the robustness concept as applied to evolutionary processes. We then establish a definition of robustness as the maintenance of stability of a process given modifications to its structure. This definition of dynamical robustness departs from some existing ones, but, in doing so, captures a more general phenomenon. We then apply this definition to network architectures at different scales of the biological hierarchy including metabolic networks, gene regulatory networks, and ecological networks. We demonstrate, independent of scale, that networks with the most hierarchical architectures are the most robust. 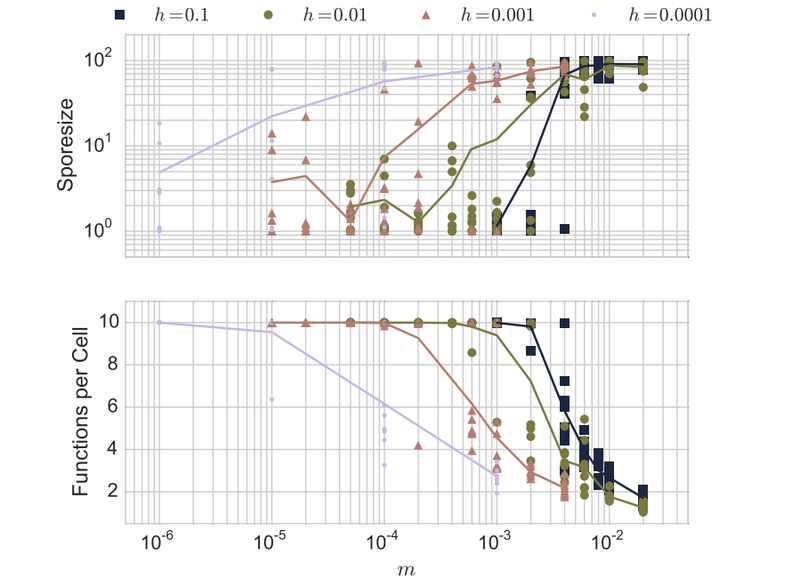 This theoretical prediction is open for further testing against empirical observations of the structure of various kinds of biological networks. Universal Semantic Communication (USC) is a theory that models communication among agents without the assumption of a fixed protocol. We demonstrate a connection, via process information, between a special case of USC and evolutionary processes. In this context, one agent attempts to interpret a potentially arbitrary signal produced within its environment. Sources of this effective signal can be modeled as a single alternative agent. 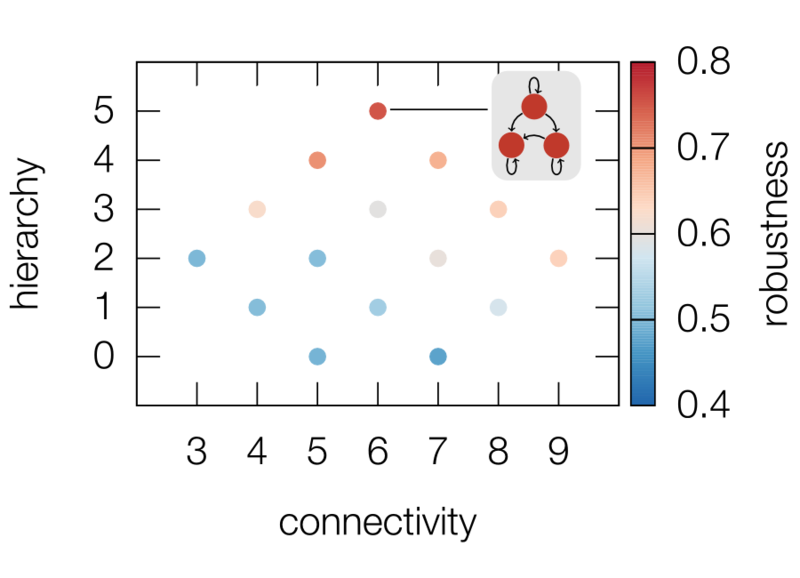 Given a set of common underlying concepts that may be symbolized differently by different sources in the environment, any given entity must be able to correlate intrinsic concepts with input it receives from the environment in order to accurately interpret the ambient signal and ultimately coordinate its own actions. This scenario encapsulates a class of USC problems that provides insight into the semantic aspect of a model of evolution proposed by Rivoire and Leibler. 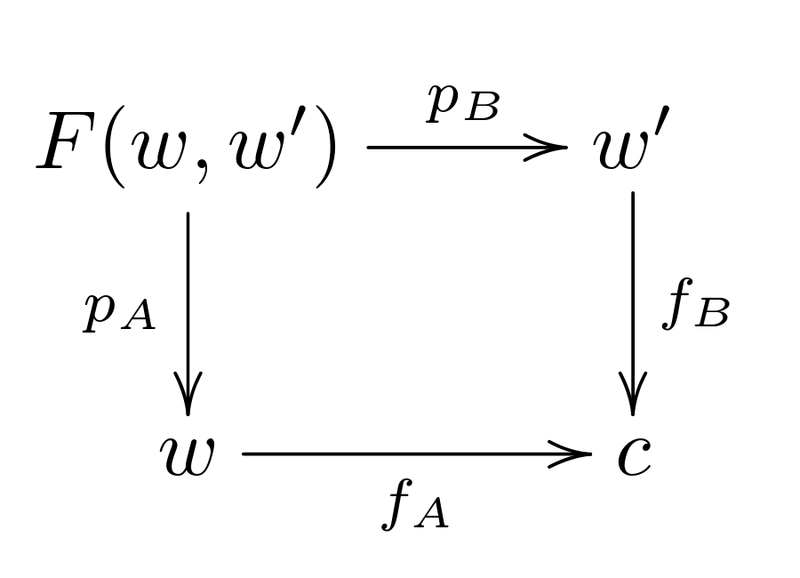 Through this connection, we show that evolution corresponds to a means of solving a special class of USC problems, is a special case of the Multiplicative Weights Updates algorithm, and that infinite population selection with no mutation and no recombination conforms to the Rivoire-Leibler model. Finally, using process information we show that evolving populations implicitly internalize semantic information about their respective environments. We explain how hierarchical organization of biological systems emerges naturally during evolution, through a transition in the units of individuality. We will show how these transitions are the result of competing selective forces operating at different levels of organization, each level having different units of individuality. Such a transition represents a singular point in the evolutionary process, which we will show corresponds to a phase transition in the way information is encoded, with the formation of self-reinforcing information bottlenecks. We present an abstract model for characterizing these transitions that is quite general, applicable to many different versions of such transitions. As a concrete example, we consider the transition to multicellularity. Specifically, we study a stochastic model where isolated communities of interacting individuals (e.g. cells) undergo a transition to higher-order individuality (e.g. multicellularity). This transition is indicated by the marked decrease in the number of cells utilized to generate new communities from pre-existing ones. In this sense, the community begins to reproduce as a whole via a decreasing number of cells. We show that the fitness barrier to this transition is strongly reduced by horizontal gene transfer. These features capture two of the most prominent aspects of the transition to multicellularity: the evolution of a developmental process and reproduction through a unicellular bottleneck. Constraints placed upon the phenotypes of organisms result from their interactions with the environment. Over evolutionary timescales, these constraints feed back onto smaller molecular subnetworks comprising the organism. The evolution of biological networks is studied by considering a network of a few nodes embedded in a larger context. Taking into account this fact that any network under study is actually embedded in a larger context, we define network architecture, not on the basis of physical interactions alone, but rather as a specification of the manner in which constraints are placed upon the states of its nodes. 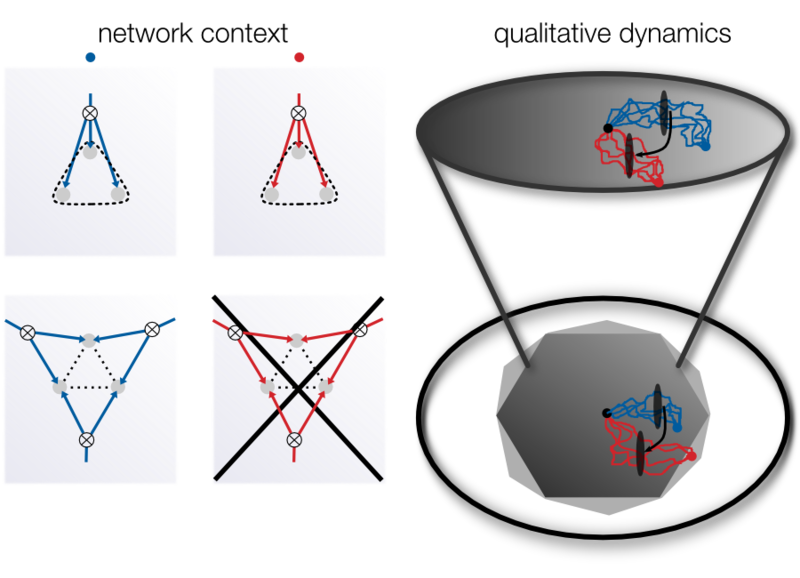 We show that such network architectures possessing cycles in their topology, in contrast to those that do not, may be subjected to unsatisfiable constraints. This may be a significant factor leading to selection biased against those network architectures where such inconsistent constraints are more likely to arise. We proceed to quantify the likelihood of inconsistency arising as a function of network architecture finding that, in the absence of sampling bias over the space of possible constraints and for a given network size, networks with a larger number of cycles are more likely to have unsatisfiable constraints placed upon them. Our results identify a constraint that, at least in isolation, would contribute to a bias in the evolutionary process toward more hierarchical-modular versus completely connected network architectures. Together, these results highlight the context-dependence of the functionality of biological networks. Loss of the DNA mismatch repair (MMR) protein MSH3 leads to the development of a variety of tumors in mice without significantly affecting survival rates, suggesting a modulating role for the MutSβ (MSH2-MSH3) complex in late-onset tumorigenesis. To better study the role of MSH3 in tumor progression, we crossed Msh3−/− mice onto a tumor predisposing p53-deficient background. Survival of Msh3/p53 mice was not reduced compared with p53 single mutant mice; however, the tumor spectrum changed significantly from lymphoma to sarcoma, indicating MSH3 as a potent modulator of p53-driven tumorigenesis. Interestingly, Msh3−/− mouse embryonic fibroblasts displayed increased chromatid breaks and persistence of γH2AX foci following ionizing radiation, indicating a defect in DNA double-strand break repair (DSBR). Msh3/p53 tumors showed increased loss of heterozygosity, elevated genome-wide copy-number variation and a moderate microsatellite instability phenotype compared with Msh2/p53 tumors, revealing that MSH2-MSH3 suppresses tumorigenesis by maintaining chromosomal stability. 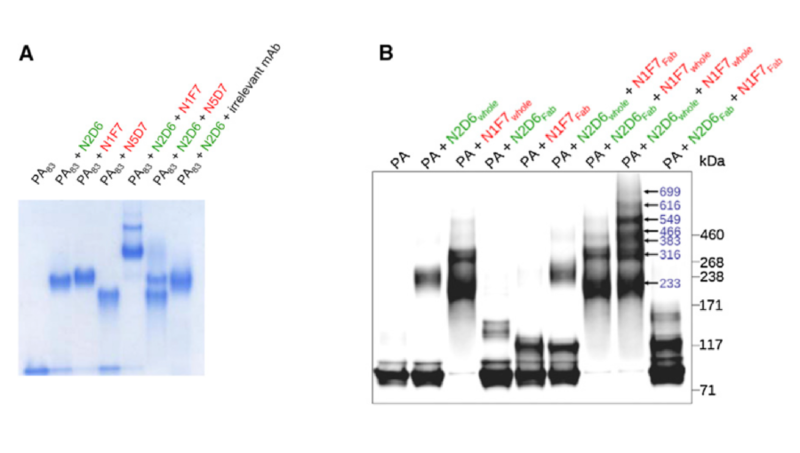 Our results show that the MSH2-MSH3 complex is important for the suppression of late-onset tumors due to its roles in DNA DSBR as well as in DNA MMR. Further, they demonstrate that MSH2-MSH3 suppresses chromosomal instability and modulates the tumor spectrum in p53-deficient tumorigenesis and possibly has a role in other chromosomally unstable tumors as well. 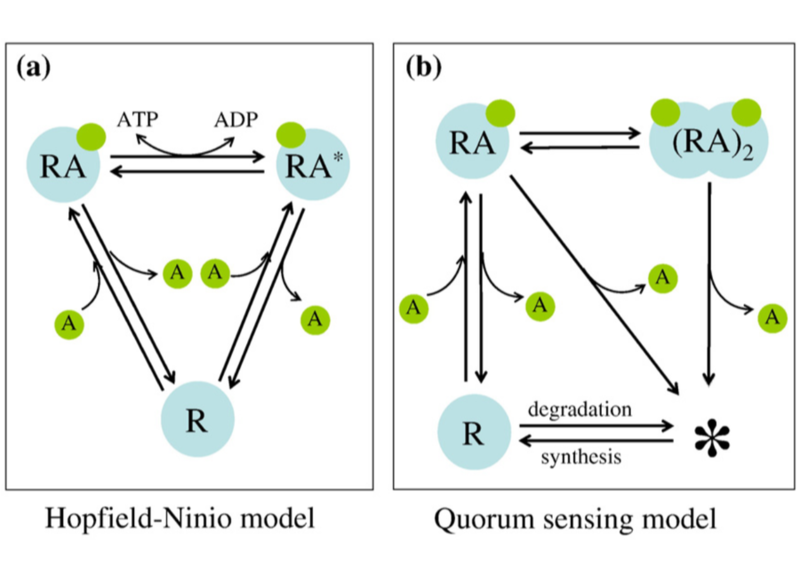 Quorum sensing (QS) is a communication mechanism exploited by a large variety of bacteria to coordinate gene expression at the population level. In Gram-negative bacteria, QS occurs via synthesis and detection of small chemical signals, most of which belong to the acyl-homoserine lactone class. In such a system, binding of an acyl-homoserine lactone signal to its cognate transcriptional regulator (R-protein) often induces stabilization and subsequent dimerization of the R-protein, which results in the regulation of downstream gene expression. 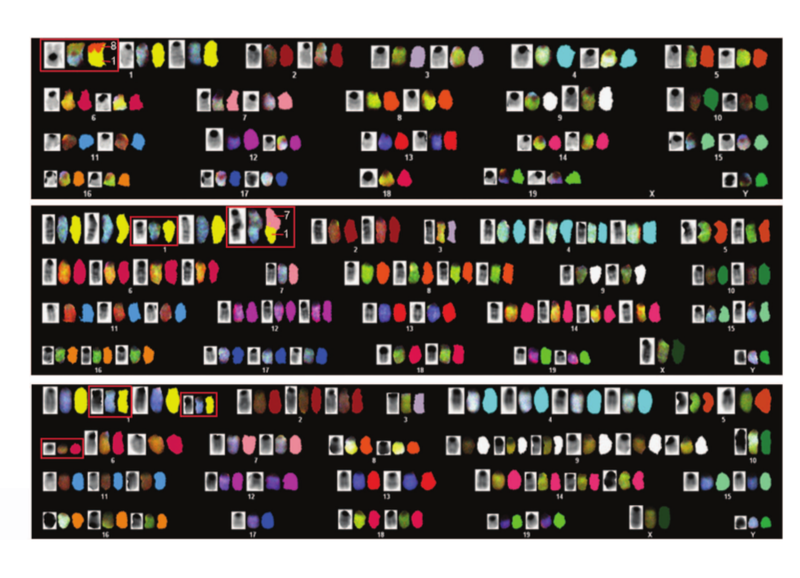 Existence of diverse QS systems within and among species of bacteria indicates that each bacterium needs to distinguish among a myriad of structurally similar chemical signals. We show, using a mathematical model, that fast degradation of an R-protein monomer can facilitate discrimination of signals that differentially stabilize it. Furthermore, our results suggest an inverse correlation between the stability of an R-protein and the achievable limits of fidelity in signal discrimination. In particular, an unstable R-protein tends to be more specific to its cognate signal, whereas a stable R-protein tends to be more promiscuous. These predictions are consistent with experimental data on well-studied natural and engineered R-proteins and thus have implications for understanding the functional design of QS systems. During infection, humoral immunity produces a polyclonal response with various immunoglobulins recognizing different epitopes within the microbe or toxin. Despite this diverse response, the biological activity of an antibody (Ab) is usually assessed by the action of a monoclonal population. We demonstrate that a combination of monoclonal antibodies (mAbs) that are individually disease enhancing or neutralizing to Bacillus anthracis protective antigen (PA), a component of anthrax toxin, results in significantly augmented protection against the toxin. This boosted protection is Fc gamma receptor (FcγR) dependent and involves the formation of stoichiometrically defined mAb-PA complexes that requires immunoglobulin bivalence and simultaneous interaction between PA and the two mAbs. The formation of these mAb-PA complexes inhibits PA oligomerization, resulting in protection. These data suggest that functional assessments of single Abs may inaccurately predict how the same Abs will operate in polyclonal preparations and imply that potentially therapeutic mAbs may be overlooked in single Ab screens. Two mechanisms that play important roles in cell fate decisions are control of a "core transcriptional network" and repression of alternative transcriptional programs by antagonizing transcription factors. Whether these two mechanisms operate together is not known. Here we report that GATA-1, SCL, and Klf1 form an erythroid core transcriptional network by co-occupying >300 genes. Importantly, we find that PU.1, a negative regulator of terminal erythroid differentiation, is a highly integrated component of this network. GATA-1, SCL, and Klf1 act to promote, whereas PU.1 represses expression of many of the core network genes. PU.1 also represses the genes encoding GATA-1, SCL, Klf1, and important GATA-1 cofactors. Conversely, in addition to repressing PU.1 expression, GATA-1 also binds to and represses >100 PU.1 myelo-lymphoid gene targets in erythroid progenitors. Mathematical modeling further supports that this dual mechanism of repressing both the opposing upstream activator and its downstream targets provides a synergistic, robust mechanism for lineage specification. Taken together, these results amalgamate two key developmental principles, namely, regulation of a core transcriptional network and repression of an alternative transcriptional program, thereby enhancing our understanding of the mechanisms that establish cellular identity. Synthetic biology seeks to enable programmed control of cellular behavior though engineered biological systems. These systems typically consist of synthetic circuits that function inside, and interact with, complex host cells possessing pre-existing metabolic and regulatory networks. Nevertheless, while designing systems, a simple well-defined interface between the synthetic gene circuit and the host is frequently assumed. 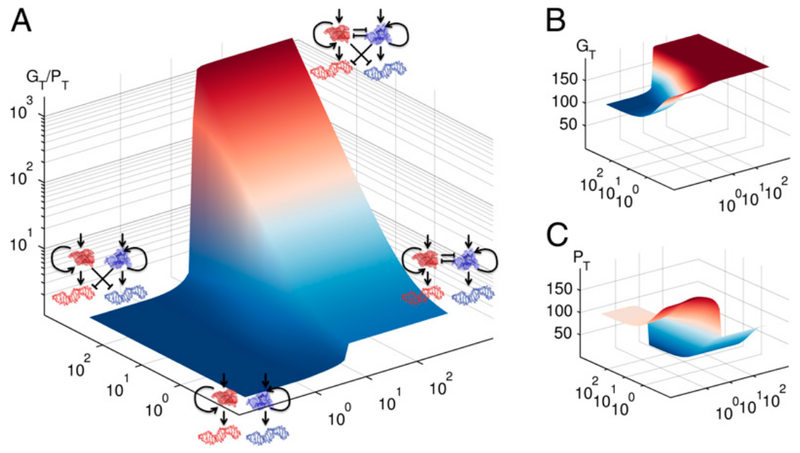 We describe the generation of robust but unexpected oscillations in the densities of bacterium Escherichia coli populations by simple synthetic suicide circuits containing quorum components and a lysis gene. 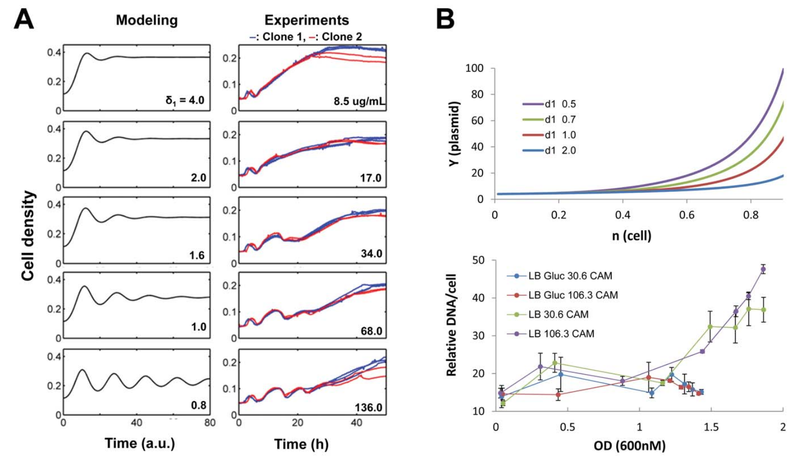 Contrary to design expectations, oscillations required neither the quorum sensing genes (luxR and luxI) nor known regulatory elements in the P(luxI) promoter. Instead, oscillations were likely due to density-dependent plasmid amplification that established a population-level negative feedback. A mathematical model based on this mechanism captures the key characteristics of oscillations, and model predictions regarding perturbations to plasmid amplification were experimentally validated. Our results underscore the importance of plasmid copy number and potential impact of "hidden interactions" on the behavior of engineered gene circuits - a major challenge for standardizing biological parts. As synthetic biology grows as a discipline, increasing value may be derived from tools that enable the assessment of parts in their final context.